Since supply-side reforms started in 2016, remarkable achievements have been made. By 2018-end, 670Mt of backward capacity will have been eliminated totally, reversing the oversupply in 2012-2015. Coal prices rebounded rapidly and profitability of coal producers have been improving. After three years' execution, the exit of backward capacity and release of advanced capacity are playing a key role in promoting the development of the coal market. 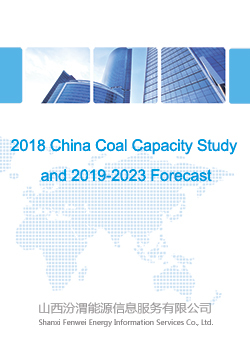 Fenwei Energy is timely releasing "2018 China Coal Capacity Study and 2019-2023 Forecast", to review coal capacity in China and by province/type, and forecast the changes of supply capacity in 2019-2023, based on its own coal capacity database. The report incorporates abundant data, figures and technical parameters, able to provide a valuable reference for you to master capacity status quo and future development of China's coal industry.